2BHK and 3BHK Flats in Delhi NCR | Saviour Builders Pvt. Ltd. The tumbling rupee and drying liquidity may bring in a productive spell in NCR’s realty market, experts say. The biggest gainer from this crisis will be the mid-range property segment. Consultants say while the rupee crash led to a rise in construction costs and the liquidity crunch has forced developers to slash prices. With property costs falling across NCR, realty experts say for those with spare capital, now’s the time to buy. Prices have dropped by 5% to 10% in south Delhi and by a smaller percentage in parts of Gurgaon. Experts say this could be the beginning of a trend that’ll last till the rupee rebounds. Till then, builders will have no bear the brunt of cash crunch. “NCR is now, what can be called a buyer’s market. Cost is escalating, sale price isn’t. There’s been a price correction in the past few months. The mid-range segment has seen the severest impact. It’ll continue for some time,” says Lalit Kumar Jain, chairman CREDAI, India’s apex body of builders. Jain adds the weakening rupee is drawing NRIs. They now have greater purchasing power, and inquiries should start turning into deals in a few weeks time. Real estate consultancy Cushman and Wakefield corroborates this. “If the rupee maintains current levels, developers will see more interest from NRI buyers,” says Shveta Jain, executive director (residential) Cushman & Wakefield India. Property developers say they haven’t seen such a slump since 2008. Developers say with every five-rupee rise in diesel cost, they shell out Rs 115 extra per square foot. Profits will further be shaved off with cost of steel expected to go up by about Rs 1500 per tonne. “The falling rupee impacts cost directly. Many materials are imported, in high-end projects particularly,” says Arjun Puri, director, Puri Constructions. Gurgaon: Condominiums or floors – take your pick! Gurgaon has undergone fast urbanization during the past few years with an influx of people from all corners of India as well as overseas. The wide gamut of industries in Gurgaon attracts a huge workforce with heavy pay packets. Consequently, there is a continuous demand for housing. In a bid to cater to this demand, developers are building both condominiums and independent floors. But what to buy is always a concern for a real estate buyer. To find out, MagicBricks.com organised a Brokers Meet who unfolded facts to help you make your choice. Ashok Narang of Insight Re-location and Realty consultant says, “Due to high plot prices, the cost of a condominium and a builder floor is at par today. However, the rate of growth is always higher in case of condominiums as compared to builder floors in Gurgaon”. Many experts feel that condominiums score over independent floors in terms of security and power backs-up. Pankaj Bansal of Oxford Realtors and Arbitrators says, “Gurgaon houses a number of migrants who have shifted due to job opportunities. These young professionals have nuclear families. For them, security in Delhi-NCR is a major concern. Therefore, they prefer condominiums over independent floors as it offers 24-hours security with latest technologies such as CCTV cameras, in comparison to gated communities or societies.” However, there is an extra cost involved in condominiums. One has to pay for security, maintenance charges, facilities and recreational activities, which can be avoided in independent floors. So, if you are looking for space, independent floors in Gurgaon can be your choice but at the same time condominiums offer an array of benefits that you may not want to overlook. The new land bill passed by the Lok Sabha is already drawing flak as experts say the bill will lead to an increase in the gestation time of projects and overall costs. The Right to Fair Compensation and Transparency in Land Acquisition, Rehabilitation and Resettlement Bill, 2012 (formerly known as the Land Acquisition , Rehabilitation and Resettlement Bill, 2011) was passed in the Lok Sabha on August 30, 2013. The bill, which replaces the century-old Land Acquisition Act, 1894, proposes a unified legislation for acquisition of land and adequate rehabilitation mechanisms for all the affected people. CRISIL Research has assessed the impact of this bill on real estate, infrastructure and industry and believes that this bill will lead to an increase in the gestation time of projects and overall costs. Real Estate: With the rehabilitation and resettlement clauses of the land bill, CRISIL Research expects land prices to increase as the expectation of landowners will be higher. The land acquisition process will be longer and project gestation period will increase. Currently, the proportion of supply (which comprises projects of over 50 acres) to total planned supply in the Top 10 Indian cities is 25%. In case of Industrial and infrastructure projects, too, CRISIL Research believes that the overall project gestation time as well as costs will increase. “Our interactions with industry players suggest that the overall project costs will increase by around 3-5%,” it says. CRISIL Research expects this increase in overall costs to impact the viability of such projects. On the request of private companies for immediate use for public purpose. Residential purposes for the poor and landless. ‘Public Purpose’ includes other government projects, which benefit the public as well as provision of public goods and services by private companies or public-private partnerships. Affected families include those whose livelihood may be affected due to the acquisition, and includes landless labourers and artisans. The bill calls for the consent of 80% of the landowners in case the land is acquired by private companies and 70% in case the land is acquired under the Private-Public Partnership (PPP) mode. The process of obtaining consent would be carried out along with the Social Impact Assessment (SIA) study. The value of the assets (trees, plants, buildings, etc) attached to the land being acquired will be added to this amount. The bill proposes that in cases where the ownership of an acquired land is sold to any person, without any development made, 40% of the profit made will have to be shared among all the people from whom the land was acquired. The new rules will apply retrospectively to cases where no land acquisition award has been made. Deepak Sharma and to those where land was acquired up to five years prior, but no compensation was paid or no possession taken place. The rehabilitation and resettlement compensation would include a house, one-time allowance and (either Rs 5 lakh or a job or inflation adjusted Rs 2,000 per month for 20 years) for each of the affected families. Families affected by land acquisition include farm labourers, tenants, sharecroppers and workers. The provisions of the bill relating to land acquisition, rehabilitation and resettlement would apply in cases where the government acquires land for: its own use and control, to transfer it for the use of private companies for public purpose (including ppp), and on the request of private companies for immediate use for public purpose. The new rules will apply retrospectively to cases where no land acquisition award has been made and to those where land was acquired up to five years prior, but no compensation was paid or no possession taken place. Wish to buy Residential Properties in Delhi NCR, Email us or SMS: SAVIOUR at 53030. Looking for Residential Flats in Delhi NCR, Email us or SMS: SAVIOUR at 53030. The Delhi-NCR property market witnessed 8 per cent fall in the number of residential units launched during the first half of 2013 amid slowdown in demand and economy, according to consultant Cushman & Wakefield. The decline in new launches was more steep in the high-end and luxury segment. “The NCR residential market registered de-growth in the total number of units launched in the first half of the year as compared the same time last year. The total number of units launched in 1H 2013 is estimated to be 20,700 which is lower by 8 per cent over 1H 2012,” C&W said in a statement. The total number of units launched in the high-end segment decreased by about 70 per cent during H1 2013 compared to the same period last year. There were no new launches in the luxury segment during the first half of 2013 due to increased availability of units in the market that are nearing completion in this segment. “Residential sector being cyclical in nature is seeing the phase where quite a few projects in the market are nearing completion prompting the investors to exit. This availability in the secondary market which is offered at a relatively lower pricing than the new launches in the primary market has made the developers conscious and mindful of infusing more inventories in the backdrop of slow economy,” C&W Executive Director Residential Services Shveta Jain said. The capital values of ready properties in Gurgaon declined by about 9 per cent q-o-q in the luxury segment with increased availabilities. Prominent high-end micro markets such as South-Central and Central Delhi saw a price appreciation of 7-15 per cent over the last year; however given the stagnant demand over the last few months, the prices have remained stable compared to the last quarter. With prevailing cautious buyer sentiments, C&W report said that South-West and South-East Delhi witnessed decline in capital values over the year as well as the previous quarter. Meanwhile, the consultant said that the unit launches for the first half of the year totalled to about 88,177 in the top eight cities of the country, up by 11 per cent over the period last year. The mid-end segment continued to constitute majority (58 per cent) of the overall launches during H1 2013. Ahmedabad, Chennai, NCR and Pune were the only cities which witnessed a decline in new project launches in H1 2013 compared to the same period last year. With land bank shrinking in Delhi, the NCR (National Capital Region) has expanded its footprints in the last 5-10 years. What factors drive demand and sales in Delhi-NCR? Demand in the residential space in Delhi and certain pockets of Noida and Greater Noida may not be encouraging this year. However, commercial space may be a favourite with developers owing to allowance of FDI and the demand from retailers, IT companies and banks. Cities like Faridabad, Bahadurgarh, Bhiwadi, Sonepat, Palwal and Rohtak may outshine due to their proximity to Delhi, boost in infrastructure development and excellent connectivity. Do you see any particular locality or area in the NCR that is expected to emerge as an investor destination? Neharpar in Faridabad is a region to watch out for. Besides, the accessibility to Bahadurgarh and Rohtak is improving. Affordability is the reason why middle income population is moving away from the more costly Noida–Greater Noida and Gurgaon to these regions. Since these markets are end-user driven, the prices are realistic. Bhiwadi is also emerging as a destination for property investment. Your take on it. The real estate market in Bhiwadi is still at a nascent stage. The demand is huge and major developers are beginning to eye this as an alternative to Gurgaon and Manesar. The infrastructure development, too, is progressing rapidly. Due to large-scale employment generation as a result of existing industries and more being set up, the demand for housing is growing by the day. Affordability is another factor that has been attracting buyers to this market. Your opinion on the infrastructural development in Bhiwadi. The authority has been proactive in ensuring that the town has all the necessities like schools, hospitals etc. All of it is because the industries have been there for a long time. In order to further make Bhiwadi attractive for investment, including large FDI, the government has proposed several measures in and around the region – being one of the seven NIMZ along the Delhi-Mumbai Industrial Corridor (DMIC), the one at Khushkhera-Bhiwadi-Neemrana belt is already approved, two new airports —Neemrana and Jodhpur, the operational Dharuhera-Bhiwadi bypass road, bullet train from Delhi to Neemrana etc are some of the proposals that are expected to increase the potential of Bhiwadi. On-ground work needs to be speeded up further to ensure a balance between growth, population increase and urbanization. Is it wise to invest in Bhiwadi? What is the expected rate of return in the next two years? It is the perfect time to invest in Bhiwadi. With the completion of all development works in Bhiwadi, increase in working population and rise in disposable income, there would be approximately 60-70 per cent appreciation in property prices in the next three years. One cannot ignore the flooring of the house, as it must not only feel good under our feet, the floors must look good too. Flooring is very essential to give an overall look to the entire home. One cannot ignore this aspect of the house, as this is the only structure of the house with which we are in perpetual contact. Thus, the flooring must not only feel good under our feet, it must look good too. Nowadays, wooden flooring has become very popular as it gives a natural and versatile look to any room. The best part of wooden flooring is that it goes well with any kind of décor, theme, furniture and accessories. But, just because wooden floors give an element of class, you cannot possibly paste every inch of your house with wooden boards or tiles—you must first ascertain the utility and purpose of a room before replacing its floor. You must have a proper plan in place before you rush to the market. First, choose the rooms where you would like to have this novelty-needless to say, exclude the bathrooms, balcony, and any other room which is exposed to excessive moisture or. Next, set a budget for the whole exercise. Remember, the cost of the flooring is only a part of the expenditure, as you will need to call in a professional to install the flooring. Now, head for the market! The market is awash in wooden flooringhardwood floors, laminated floors, bamboo floors, etc. Hardwood, or solid-wood flooring, expands and contracts with the variation in the temperature and relative humidity in the atmosphere. You will have to leave gaps between the floor and the wall to prevent the wood from cracking up when it expands. To hide this extra gap, installers use moldings. Leave this job to the professionals; if done properly this flooring is very durable. The most popular varieties used for hardwood flooring are oak, teak, maple, etc. With this flooring, you have to very careful as hardwood requires proper cleaning-not with water-you have to buy good quality wood cleaner from the market. Protect it from water as moisture can be harmful to this kind of floor. Laminated flooring is very sturdy, requires low maintenance, and is easy to install. It is resistant to water, stain-free, as well reasonably resistant to scratch marks. Select thick flooring (tiling) as it is more durable compared to thinner versions. Laminated floors give luxurious look to any room. Bamboo flooring is the latest trend in décor and it is gaining popularity owing to its durability and sustainability. People choose bamboo flooring for their living space and commercial areas as it lends a stylish and elegant look to the whole room. People who earlier on had gone in for hardwood flooring are now shifting their preference to the bamboo floors-bamboo floors not only come with the same properties as hardwood floors, they are comparatively cheaper to boot. This type of flooring is environmental friendly too. Bamboo flooring is harder than the hardwood floors. If you are going for the bamboo flooring, you can get carbonized bamboo floors, strandwoven bamboo floors, etc. Wooden floors give sophisticated look to the living space. This flooring does not require any extra effort on your part to give your place that classic or antique look. And, if you can invest a little time and care, these types of flooring are very durable. You could mark the trance of your home using wooden tiles along the border. Most people love to floor up their kitchens using wooden tiles, but this preference calls for extra care-against fire, water, and food droppings. If you have furniture in a light shade in the living room, select darkcoloured wooden floor or vice versa, as they will complement each other. Wooden floor also look great in the bedroom, as well as in the home office, but be careful while rolling furniture and book racks as this will spoil the finish of the wooden floors. Finally, remember — good cleaning habits play a vital role in maintaining your wooden flooring. The best part of wooden flooring is that it goes well with any kind of Decor, Theme, Furniture and Accessories. Looking for Apartments in Ghaziabad, Email us or SMS: SAVIOUR at 53030. Given a choice, would we leave our old homes, where we spent 30-40 years, for a plush new flat-or renovate that dear old house, where our fondest memories are locked? Noted ad guru and film personality, Prasoon Joshi, said in an interview that even though he lives in a very spacious and nice flat in Mumbai, he considers his nest in Nainital as his dream house. He says that when he reflects upon his childhood days, he finds himself in that old family home. Although it is now very old and not well maintained, he says he loves it and is very attached to it. It goes without saying that you too would have many memories of your childhood home. The question is, if one has the choice (money! ), would we leave our old homes, where we spent 30-40 years, for a plush new flat. Of course, one always has the choice to either move to that new house or renovate that old home. It has been observed that while most of us care for the upkeep and maintenance of an old car or our physique when we are old, the same kind of care is not paid to a house when it is old. Somehow, we presume that a house is a permanent and solid structure which time does not touch. “Most of us mistake maintenance for renovation, which is not the case. To renovate an old house, elaborate examination of ‘weak links’ and application of new technologies for better and comfortable living is necessary. An example of renovation is the upgradation of bathrooms with latest anti-skid floor tiles and fixing of rails around the walls for good grip if elders are living in the house. In order to protect the house’s beauty, it is important that we follow some principles of maintenance. To start with, it is necessary to clean the roof and outlets often. In case there are trees around the house, dry leaves will block the flow in drain holes, which have to be removed, or the water will get clogged and seep into the walls,” Sanjay Khanna, director of Kailash Nath Projects, says. There are many agencies that undertake the job of home repair services as well as maintenance services go to the Google and you will find many such agencies catering to your local area (if you live in a city, that is). Experts say that it is important that you must set apart some money for unexpected repairs and replacements if you live in an old home. “Many modern repair techniques and materials, even for ordinary troubleshooting, can actually harm an old house. Those who live in old houses need to have their buildings professionally assessed by an architect, surveyor, or an engineer,” Gaurav Mittal, MD of CHD Developers, says. Of course, the vagaries of time take its toll on water pipes, plumbing, plaster, etc, of your house. These have to be attended to before they magnify into serious structural problems for the house. “Badly painted iron downpipes can rust through and leak. A leak may only be a joint that needs remaking but if the pipe is broken or rusted through then it is preferable to replace the pipe, with the same material,” Alimuddin Rafi Ahmad, MD of ILD Developers, says. Lala Narayan Prasad, 88, refused to shift to a Greater Kailash house where the other members of his family migrated-he is too much attached to his Old Delhi house to abandon it to builders. “It is where I, my father and my grandfather were born. I keep on spending money on the maintenance of this dream house. As old houses used relatively simple technology, it is often possible to replicate their original mortars, plaster, paint, and finishes that help to preserve the appearance of these old-modelled houses,” Prasad, who is also one of the oldest charted accountants of the capital, said. Ajay Agarwal, director of Avalon Developers, says: “It is not uncommon to see houses and apartments in a very sorry state owing to the lack of proper maintenance. Falling balconies, leaking toilets, seepages running across walls and roofs is an all too common sight everywhere. One major reason why people shift from old houses is that these houses, often multistoreyed, have no lifts and the elderly members of the family find it very difficult, if not impossible, to walk up or down long flights of staircases.” Many people would like their old houses to reflect many of the original qualities of finish and appearance, which is perfectly possible. However, one major necessary renovation that people who love their old house must go for is to change the electrical wiring of the entire housefor safety, and for efficiency. Knob and tube wiring is the most common type of old-house wiring that one can still find in such houses. This wiring is easily identified since it is strung between ceramic knobs, which are attached to the beams in the house. The problem with this wiring is that it is potentially unsafe. The system is not grounded, which means you can get a shock from it. If you are one of those people who are dearly attached to their old homes, as these bind you emotionally to your childhood, you need to spend money on its upkeep regularly. Remember, a stitch in time saves nine—regular maintenance is cheap and will prevent major structural problems in your old, dream house. Many modern repair techniques and materials, even for ordinary troubleshooting, can actually harm an old house. Those who live in old houses need to have their buildings professionally assessed by an architect, surveyor, or an engineer. If you are one of those people who are dearly attached to their old homes, as these bind you emotionally to your childhood; you need to spend money on its upkeep regularly. Just remember, a stitch in time saves nine. Willing to purchase Properties in Delhi NCR, Email us or SMS: SAVIOUR at 53030. 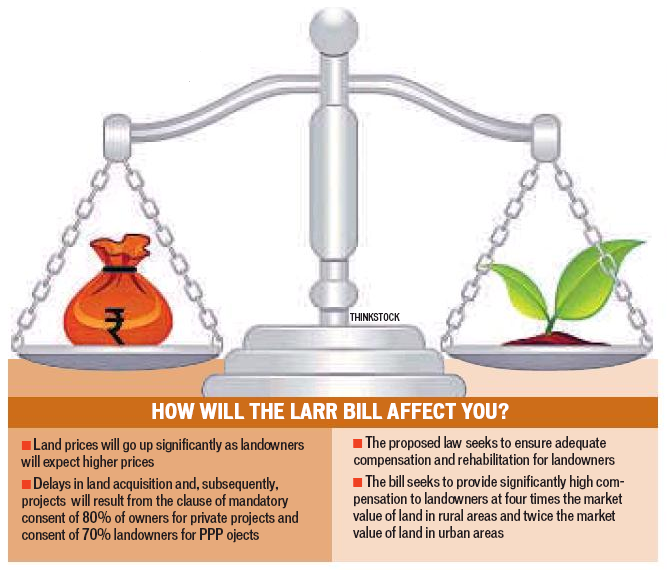 The land acquisition bill is likely to double land prices – so get ready to pay more for a house. The passage of the much debated Land Acquisition, Rehabilitation and Resettlement (LARR) Bill, 2012, through both the houses of parliament, has come as good news for landowners in the long run. Those hit in the process will be developers who will be paying higher prices for land acquisition and passing on the costs to homebuyers. The bill seeks to provide significantly high compensation to landowners at four times the market value of land in rural areas and twice the market value of land in urban areas. This will lead to increased cost of land, pushing up project costs and, therefore, margins of developers, say experts. Mayank Saxena, managing director, land services, Jones Lang LaSalle India, says that anyone without an existing land bank will now be looking at vastly increased entry costs. According to CRISIL Research, land prices will increase as landowners will expect higher prices. The acquisition process will get longer and project gestation period will increase. In case of industrial and infrastructure projects, the overall project costs will increase by around 3 to 5 percent. This will impact the viability of such projects. An immediate reaction, say real estate experts, is that the realty market is frozen. Farmers have already started quoting abnormally high prices for their land, and in the next 18 months, finding any product in the range of R4000 per sq ft could be difficult, even in far-flung NCR areas. According to Anshuman Magazine, CMD, CBRE South Asia Pvt Ltd, this bill will make it more difficult to acquire land and will act as a deterrent for investment into large township projects. The provisions of the bill will be applicable in cases of land acquisition of 50 acres in urban areas or 100 acres in rural areas. Thus, the cost of land acquisition will surely go up for all projects irrespective of them being government or private or Public-Private Partnership (PPP) projects as they will have to adhere to the new norms, says Sanjay Dutt, executive managing director of South Asia, Cushman & Wakefield. Delays in land acquisition and, subsequently, projects, are also likely to result from the clause of mandatory consent of 80% of owners for private projects and consent of 70% landowners for PPP projects. Those already invested in large parcels of 75 acres and above are in a Catch-22 situation. They will either be forced to finish projects quickly or launch at higher prices. Ankur Srivastava of GenReal Advisers says that as far as joint development is concerned, not many would be ready to enter into such a partnership when there is no clarity on land valuations. “How does one arrive at the market value of the property in some areas?,” he asks. Even in areas that have recently been brought under the ambit of various master plans, the bill will lead to confusion because of the ambiguity on account of land being categorised as either rural or urban and the compensation multiplier that will be applicable to it. This could end up negating the master planning efforts due to the unforeseeable land acquisition timelines, Srivastava adds. In a move that could deal a body blow to threatened forests and water bodies in the National Capital Region, Haryana government has successfully got restrictions on construction activity in ‘conservation zones’ deleted from the revised NCR regional plan, which is now in the final stages of getting notified. If the change is notified, all four state governments in the NCR will get a much freer hand in allowing constructions in eco-sensitive zones such as the Aravalis and the Yamuna riverbed. Although mandatory clearances would still be required, the earlier clause that restricted constructions in these zones to just 0.5% of the owned land — that is, only 20 sq m in an acre — has been jettisoned. The dropping of the restriction clause came to light after an RTI application allowed green activists to access files related to NCR plans. The original regional plan for NCR 2021 has a clause that restricts constructions for “regional recreational activities” in natural conservation zones. “The design behind this move is clearly to allow a mega tourism complex at the Mangar forest off Gurgaon-Faridabad road, which is considered sacred by the locals. Questions were raised by the environment ministry and NCRPB on why the draft Mangar development plan did not identify the forest as a conservation zone. Now, Haryana government has found another way of building the tourism complex. They will get all their other pending projects cleared after the amended NCR plan comes into force,” Oberoi alleged. Environment analyst Chetan Agrawal said that the change will have serious repercussion on the ecology of the entire NCR. “This blanket shift in planning norms will come as an advantage to all the state government to allow unlimited construction in eco-sensitive zones. The provision of identifying and protecting the eco-sensitive areas has been there since 2005 when the 2021 plan was prepared. But this has been ignored in the successive master plans by member states,” he said. Agrawal added that the change goes against the thrust of NCRPB, which has called for better planned development for sustainability and conservation of eco-sensitive areas. Constructions in natural conservation zones will threaten the catchment areas of major Aravali lakes such as Damdama and Dhauj. The amended regional plan has been approved by the NCRPB apex committee which includes the Union urban development minister and chief ministers of Delhi, Haryana, Uttar Pradesh and Rajasthan. The board invited public objections to the draft revised plan, which ended on August 30. Ironically, the draft plan notes with concern that green areas in NCR have declined from 4.3% in 1999 to 3.3% in 2012, a drop of 23%. The document says more areas should be brought under green belts. The first comparative satellite-based study of change in land use in NCR had shown that between 1999 and 2012, the region lost 32,769 hectares of green areas and 1,464 hectares of water bodies. While Uttar Pradesh recorded the maximum loss at 17,386 hectares, Haryana lost 8,716 hectares. NCRPB’s nod for planning by states has become crucial after the Noida Extension episode where housing projects were stalled simply because the board had not approved the UP government’s plan. The Allahabad high court had cited this as the reason why it had put a stay on the construction. Looking for Flats in Delhi NCR, Email us or SMS: SAVIOUR at 53030.